To make her eyes look bigger, Pattie revealed in May 1965 that she “put on several coats of mascara, but before I do this I draw a line in black eyebrow pencil across my eyelids at the roots of my eyelashes. I don’t curl it up at the end like most girls do. I extend it slightly out and downward” because she believed it contoured her face and made her eyes appear rounder. After this, apply your eye shadow. Pattie advised keeping a palette of eye shadow colors on hand in order to match to your clothing and coloring. “I keep brown and blue-grey [shadows]…always,” she told 16 Magazine in September, 1965. To apply shadow use a brush, “imagine a line straight from where the inside of your eyebrow starts to just above the inside corner of your eye. Start to gently brush on eye shadow from that point, arching the line slightly upwards and keeping it just above the first crease in your eyelid. When you reach the peak spot in the middle, start sloping downwards, stopping the eye-shadow just above the end of your eye line. This makes your eyes look very exciting!” Pattie also applied her mascara to her lower lashes, but told girls to do this only if it looked good on them. “If it suits you, do it,” she said, “if not, skip it.” Although not necessary, false eyelashes can be used to make one’s eyes seem larger. 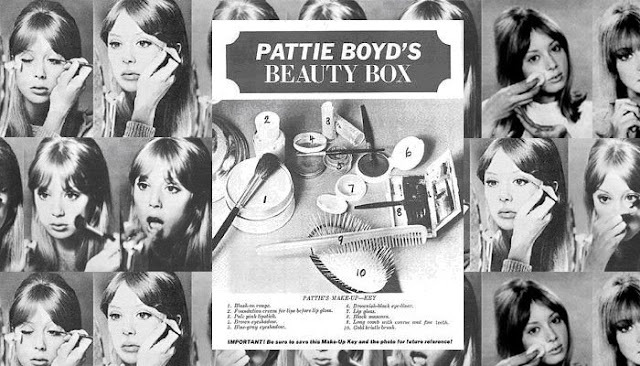 Pattie used them rarely, never as much as Twiggy, but this was because she was born with great lashes herself and rarely felt the need. But, if you are looking to buy Pattie-worthy lashes, look for thick lashes as opposed to longer lashes. Falsies, as they are often called, can be found in just about any drugstore or makeup store out there. On her lips, Pattie used a dab of foundation cream to take the color out of them. She tended to not used lipstick, but would sometimes put a topcoat or gloss over the foundation so that her lips didn’t look dried out. Though not all of us were blessed with a naturally full, borderline-Bardot mouth like Pattie was, we can fake it. Using a lip plumping gloss or applying a pale gloss a little outside of your lip lines can give the illusion of a fuller pout. Pattie was well-aware that in order to have good skin, “you just may have to make a few sacrifices” by cutting out junk foods and following a thorough skincare regimen. “First off,” she declared in the November 1965 issue of 16 Magazine, “you all know that cleanliness if a prime requisite when it comes to having a pretty face,” advocating twice daily washings and moisturizing. Pattie also advised applying makeup in the correct light, so it comes out looking as natural as possible. This brand has been still in the market to get the quality makeup items to be used throughout the globe. It is only because of the quality they have been gaining so much demand. Every product in this beauty box are being used by the girls from the very first time it was invented. I am also having a beauty box at my dressing table which I am using all the time. Screenshots are now used as the proof that when people deny to accepts that thing. You can also use this as an elite assignment help approval so that you cannot face any difficulty. During higher studies in colleges, students often have to prepare multiple documents, quizzes, and surprise tests. This is the main reason why most students search for online Assignment Writing Services over the internet and choose only the most proficient and trusted academic writing experts.